I can see how this book could bring on some controversy and some heated debates… in this book the doctor tells you to put away your jogging shoes, stop doing aerobic workouts and to basically forget about conventional workout methods that you are doing now. Dr. Sears says if you tell the info in this book to your doctor they will probably not agree. 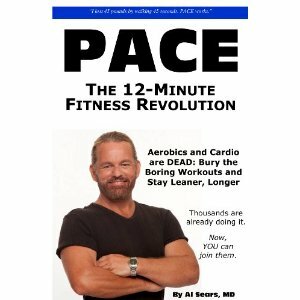 About halfway through the book, after thorough explanations of his theory, Dr. Sears starts you on your new workout regimen. You start slowly figuring out when your body has created what he calls “oxygen debt.” He says this is when the good stuff really happens. This book is full of testimonials, which I really enjoyed and is packed with useful information about how our bodies work. There really is so much in it that I am going to go back through it and re-read it~ I plan on trying out Dr. Sears’ methods, because what he says sounds reasonable. 🙂 All I have to lose is weight! Try it with me. Seems like a great idea.